New Frog Specie Discovered In Australia! Scientists have been observing a new frog specie that was recently discovered in the lower part of Southern Australia. Litorida cerulela; the Strawberry Frog can grow up to 10 centimeters (4 inches) in length. Its color depends on the temperature of the environment, ranging from light pink to deep red. The Frog eats insects, mosquitoes as well as small tree ants that it catches with it’s long yellow tongue when climbing up trees in search of food. 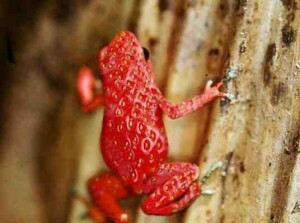 Strawberry Frogs were found to be nocturnal and come out in early evenings to call and hunt at night. During the day they find cool, dark, and moist areas to sleep.